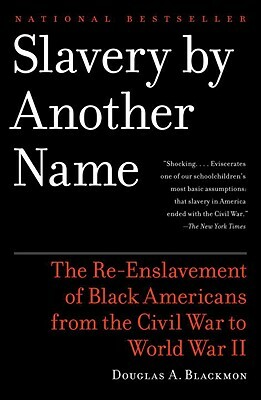 A Pulitzer Prize-winning account of the “Age of Neoslavery,” the American period following the Emancipation Proclamation in which convicts, mostly black men, were “leased” through forced labor camps operated by state and federal governments. In this groundbreaking historical expose, Douglas A. Blackmon brings to light one of the most shameful chapters in American history—an “Age of Neoslavery” that thrived from the aftermath of the Civil War through the dawn of World War II. Using a vast record of original documents and personal narratives, Douglas A. Blackmon unearths the lost stories of slaves and their descendants who journeyed into freedom after the Emancipation Proclamation and then back into the shadow of involuntary servitude shortly thereafter. By turns moving, sobering, and shocking, this unprecedented account reveals the stories of those who fought unsuccessfully against the re-emergence of human labor trafficking, the companies that profited most from neoslavery, and the insidious legacy of racism that reverberates today. A native of Leland, Mississippi, Doug Blackmon is the Wall Street Journal's Atlanta Bureau Chief. He lives in Atlanta with his wife and their two children.